﻿ Are opossums dangerous to cats, dogs, or other pets? Are opossums dangerous to pets? An opossum may look tiny and cute, but they can be very dangerous to your pets. Somehow, the giant rat-like creature can threaten everything from barn animals to fish to pets like dogs and cats. An opossum has 50 teeth, all of which are as sharp as you may think. Well, actually they are not as harmful as you may think. In fact, an opossum does not usually bite you when you are close to them. You can hit them with a stick and they will just run. Of course, it is not recommended to do such an act. However, this is just to explain how little of a threat an opossum is. The reality is that they may feel threatened by you or your pets. It is a common thing for animals to attack others who reach a closer range near them since they feel insecure. They will do what it takes to secure themselves. 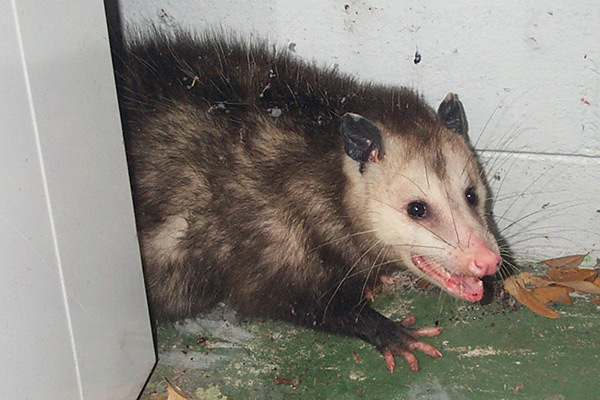 Thus, if you find that an opossum is attacking a pet, it is likely that your pet had attacked the opossum first. Opossums have another less violent defense mechanism as well – they play dead to avoid human or predator encounters. A funny thing found by studies is that the opossums have no idea how to control the ‘play dead’ situation. Somehow, their brain triggers the act and their instinct helps them to carry out such an act. The creature confuses their opponents smartly by playing dead. This way, they hope that the opponent will leave them in peace and not try to attack. The brain triggers them to get in a temporary paralyzed state for a matter of seconds to minutes. When they meet a bigger size of creature or human, they often appear to be dead instead of trying to fight. This is why getting rid of opossums is much easier for humans since they are paralyzed and you could easily take and relocate them somewhere else. However, watch out for the opossum behavior as they could change into a harmful predator in times of trouble.